Students in my New Media class have been wanting me to grill out. They've been hearing about my barbecue master blog and Yes You Can Grill site for a year now. So, today is the day. I started packing last night, and I'm almost done. 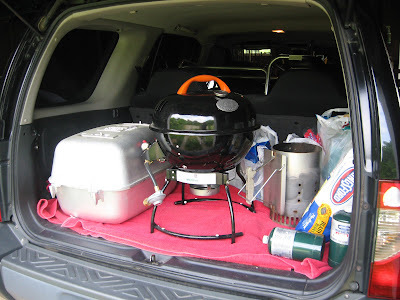 It's amazing how much stuff it takes to grill out. Your barbecue gear is usually right inside the kitchen door at home but not so handy on the road especially if you forget something critical. I thought I'd share my check list. 1. Grill - It's not a grill out if you don't have one, right? 2. Fuel - Be sure you have plenty of charcoal or a back up gas tank. It's not any fun to have to stop in the middle of grilling to go find more fuel. 3. Fire Starting Material - With charcoal, I find it easiest to take the chinmey starter and some newspaper. Also, don't forget the matches or a lighter. 4. Cooking Tools - Turner, tongs, fork etc. 5. Hot Mitts or Gloves - When you're playing with fire, you need to protect your hands. 6. Food - Oh how sad if anyone forgets the food. But, seriously, it's easy to forget the condiments or foods left in the refrigerator until the last minute. A second food check list is a good idea, since that varies depending on the menu. 7. Serving Containers - Don't put grilled food back in containers where it's been marinating. That's not healthy. So, bring pans or trays to transfer grilled food to when done cooking. 8. Utensils - You may be able to get by without these if you serve hot dogs and chips or similar, but it's a good idea to have some on hand regardless. Kids, for example, may like weiners sliced which is hard to do without a knife of some sorts. 9. Paper Products - Plates, cups, napkins. Actually, paper towels may be a better bet especially if it's a windy day. 10. Zip Lock Bags - You don't want to waste great grilled food, so have a few baggies tucked pack. That keeps food from getting all wet in the cooler. 11. Coolers - Depending on the size of the group, you may need more than one cooler. I have a large one for the meats today plus a small cooler with drinks on ice and a third for condiments. 12. Trash Bags - There may be a trash can available, but maybe not. A trash bag takes up very little space and often comes in handy.